Category Side Dishes and tagged paleo sweet potatoes, Sweet potatoes with herb butter. Tomorrow morning my husband and I are participating in a local adventure race. It's teams of 3, and it consists of running, biking, and canoeing. We actually have no idea where we will be going, and doing. There will be random mystery challenges throughout the race as well. It should be really fun. I wanted to cook us a good meal so we will be fueled for our race tomorrow. I bought some rib eyes to grill outside, and I roasted some beets that I got this week from my trip to Inglewood farms. Then.... I made these sweet potatoes that are absolutely delicious. 1. Start by cutting the potatoes into 2 inch cubes. Add them to a large pot, cover with cold water, and add salt. 2. Bring to a boil and let boil for 10 minutes. Next, drain and cool for 20 minutes. They will only be partly cooked, and yo must allow them to dry before you cook them. 4. Toss potatoes in oil and salt and pepper to taste. Spread on a baking sheet and roast for 45 minutes or until crispy. 5. While potatoes are roasting make the herb butter. Mix softened ghee with parsley, rosemary, and thyme and season it with salt and pepper. 6. When potatoes are done cooking, put them into a large bowl and toss them with the herb butter. 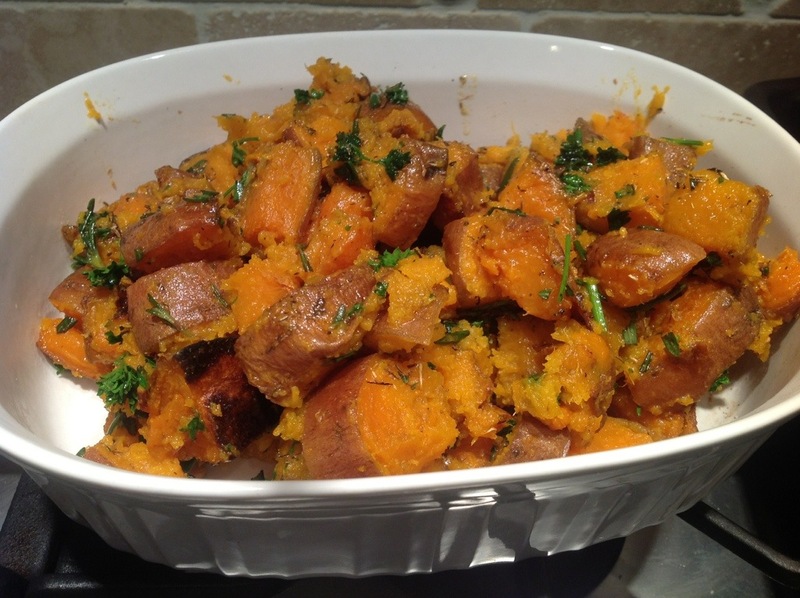 This entry was posted in Side Dishes and tagged paleo sweet potatoes, Sweet potatoes with herb butter. Bookmark the permalink.